I started training Judo at age 13 with Korean Grandmaster Bong-Yul Shin. 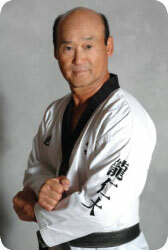 Master Shin is 9th degree black belt in Judo, Tae Kwon Do and Aikido and a graduate of the Yudo College in Korea. His school was a small, 2nd floor space above a meat shop without heat or air conditioning. We would complain about the cold and he would reply, ï¿½You remember in the summer time when you wished it was cold, now itï¿½s cold.ï¿½ Likewise, in the summer, he would remind us that our wintertime wish had arrived. Master Shin was in his office most of the time during warm ups, and would walk out with his red and white belt during technique and give a disparaging look or shake his head at our poor form. For the most part, his black belts would run the technique portion of class and Master Shin would take over during sparring. Due to his travel schedule, we could go weeks without seeing Master Shin. He was the personal bodyguard to August Busch IV. Gary Prendeville, Shinï¿½s black belt, was the bodyguard for August Busch III. Master Shin only yelled at me one time when we were eating after class because I didnï¿½t finish all of the food I ordered. When I say yell, I mean scream. Apparently growing up in Korea in the 50ï¿½s there wasnï¿½t a lot of food. He referred to all of us Americans as spoiled. His rule was that if you order it, you eat it. To this day I eat everything I order. In our class was a mix of adults and kids, ages 6 to 80 with a few bad apples. The leader of the troublemakers was a 12 year old named Michael. He would often make smart remarks during class. I specifically remember him asking Master Shin if he could beat up Mike Tyson. This was the mid-80s and Tyson was the king, after all. Master Shin shook his head at Michael, said nothing, and walked away. This went on for months. One day, without warning, Master Shin walked out of his office and asked us all to sit down against the wall. One by one he called out the troublemakers and choked them unconscious. 3 in total if I remember correctly. He would choke them out, sit them up, slap them on the back to wake them up and send them back to the wall. I sweat uncontrollably waiting for him to call my name but it never happened. Thankfully, I knew better than to say anything during class. That was the last day anyone talked during Master Shinï¿½s class.